Back in March when I was knee deep in monster birthday party planning, I came across fleece fabric at JoAnn’s that had little monsters on it. I had no idea what I was going to do with it, but I went ahead and purchased 2 yards of it anyway. And its been sitting on my craft shelf ever since. 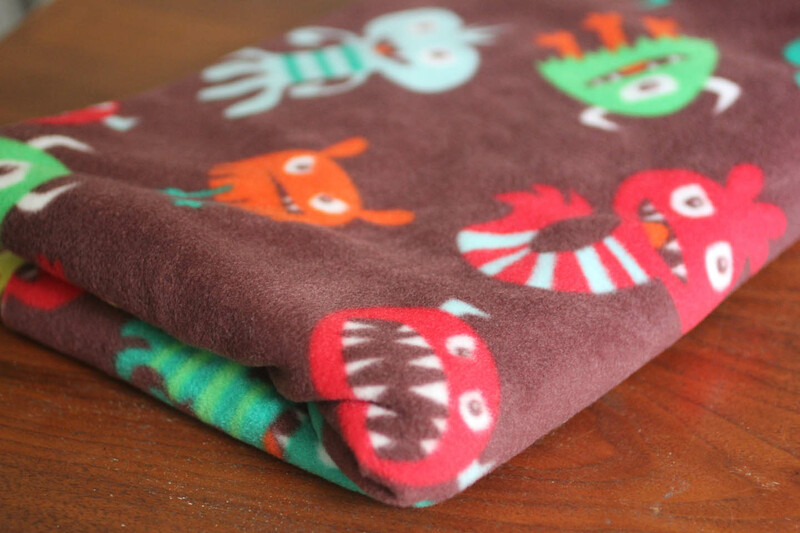 When I found out this weeks One Crafty Contest material was fabric, I knew it was time to put the monster fleece to use! I don’t own a sewing machine nor do I know how to sew – Yes, there is something I can’t do :o) But I had recently learned how to crochet around fleece for the Project Linus Blanket Drive. 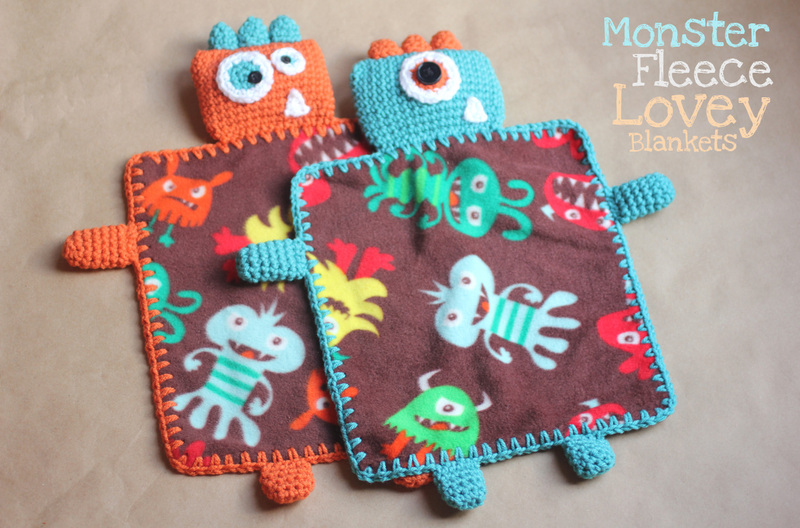 I thought a blanket was too boring, but a monster lovely would be perfect! First I cut a 10.5 x 12 piece of the fleece fabric. I created holes to crochet through with a skip stitch blade and a ruler as a guide. Holes should be made about a 1/2 inch from the edge. 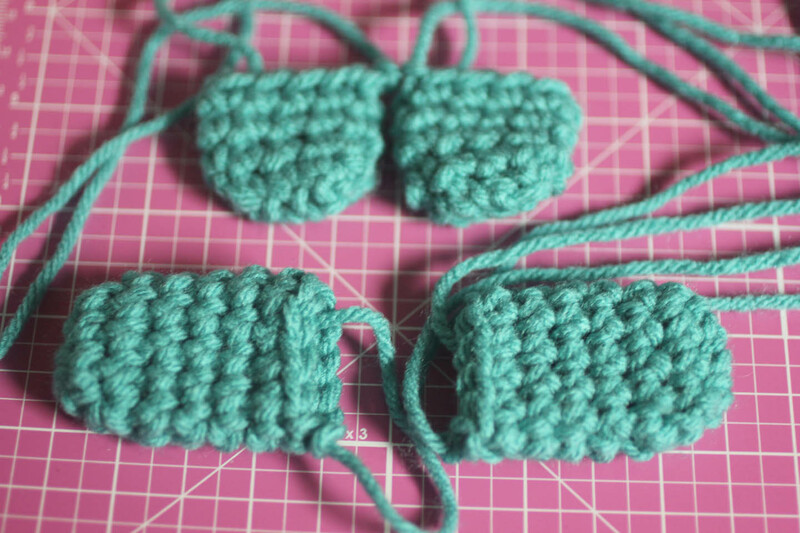 It is also helpful to cut the corners into rounded corners so it will lay down flat when you crochet the edge. which I purchased from Amazon. Here is the crochet pattern I came up. Remember that when following the patterns below, you can easily adapt them to make the head and limbs bigger by increasing the chain length and row length. Feel free to use this as a loose guide. SC in second chain from hook, and in the next 16. Working in rounds, SC 16, 2 SC in next stitch, SC 16, 2 SC in next. Stuff with a small amount of polyfil and sew shut. Join, fasten off leaving long tail to sew on. Leave long tail for sewing on. Tip: If you leave a long tail when starting your Magic ring, you can use it to stuff the horn. Please Note: This pattern uses buttons and has small parts which could potentially become choking hazards if they come off. Please use caution if making this for a baby or if giving to a baby. 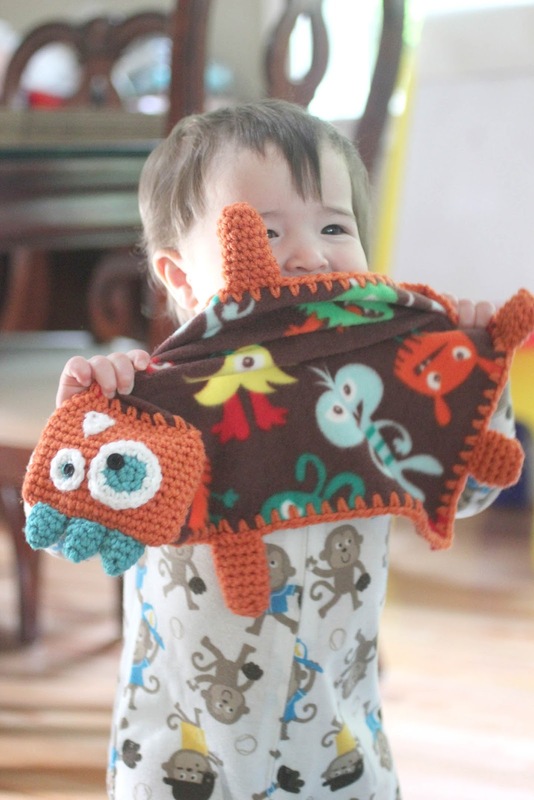 If I was to make this for an infant, I would not use buttons and use black yarn instead. Oh, and did I mention how much I hate weaving in ends? Just look at this mess! This is so adorable, my niece is having a baby in August and I have to make her some! Thanks for sharing your fun project with all of us! thes little cute dresses will suite my little boy. loved it and will tell my wife to try this. she loved knitting. These are absolutely fantastic. What a brilliant idea and tutorial. I cant WAIT to make this!! O M GOSH!!!!!!!!!! This is sooooooo AWESOME!!!!!!!!!! THANK YOU for making it free!! That is so wonderfully kind of you!! what size skip stitch blade did you use? the original? Yes, I used the original size. Sorry I didn't mention that in the post. Also, I used a size G (4.0 MM) hook to crochet around the edges of the fleece and size H (5.0) hook to crochet the monster parts. Do you have any tutorials on sewing things on? I suppose I could probably figure it out, but a tutorial would be so handy!! What a great idea! They are adorable!! 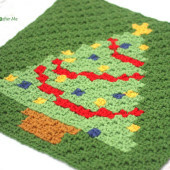 I really can't wait to make one of these! Lovely! Nice to fond youtube blog ! Awesome! 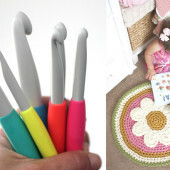 You could also use the Sharp Crochet Hook to crochet directly through the fabric in one step so you don't have to use the rotary cutter on it first. Thanks for the tutorial! Love this! They turned out great! Did you sc around the edge of the blanket? I couldn't find where you mentioned that. I did see you used a size G hook for the edging and a H hook for the monster parts. Can't wait to make some of these! that's what I figured it was– but thought I had better ask before I destroyed something! Thanks for getting back to me so quick! I'm off to JoAnn's now to find some fleece! Love it!!!! Pinned and put on my summer crafting list. 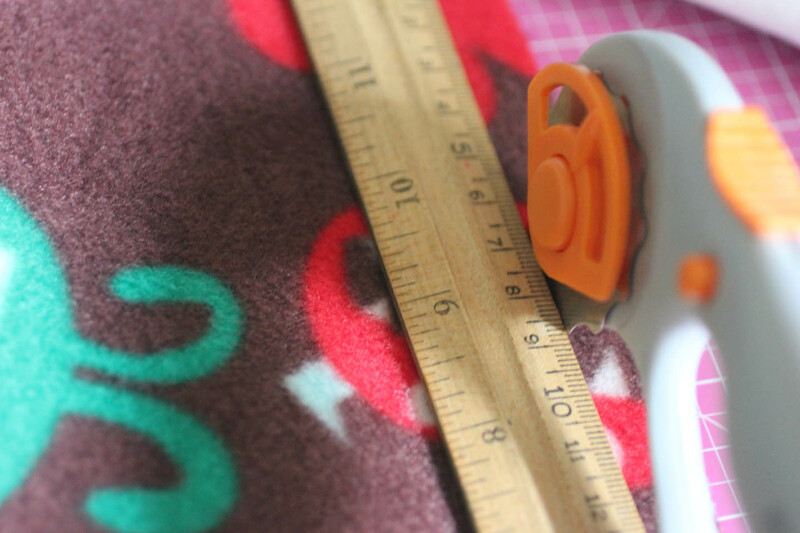 I found TONS of cute fleece at JoAnn's… and even the same monster fleece as you used! BUT I couldn't find a skip stitch blade so I had to order one. Ordered it from PL like you suggested. I was very pleased to find out they don't kill you on shipping! Yay! Hopefully I will be making some loveys by the end of the week! Thanks again for the great free pattern! These are so adorable! Thanks for sharing! 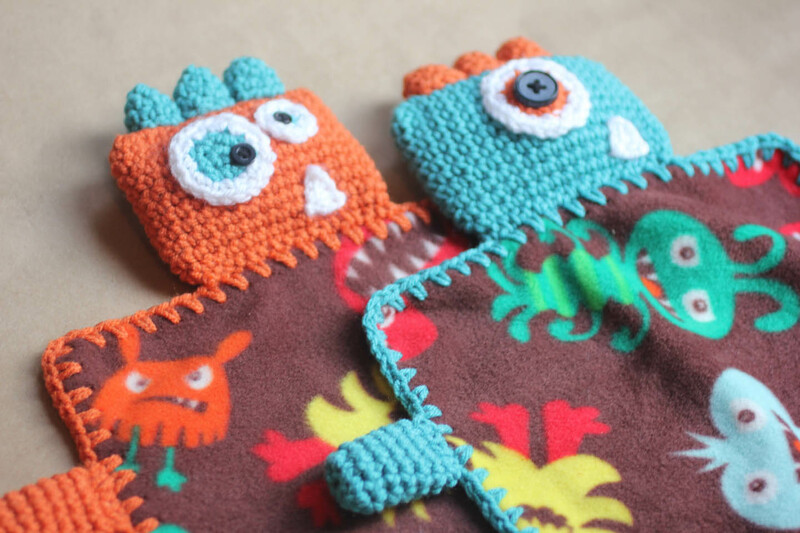 I used to work at JoAnn's before we moved and have collected several totes full of fabric and fleece (yarn, craft stuff…anything and everything that was on sale that I thought I would someday use), so I will have to dig it out and make some of these for my little monster grandchildren! Amanda, I am so jealous of your fabric stash! How neat that you collected and saved fabric from when you worked at JoAnn's! Let me know how they turn out! Wow! How fun to have a follower from Germany! So happy to hear you already made a blanket. Even though you couldn't find the exact supplies, I am sure it turned out great! Feel free to post a picture of it on my Facebook page! What a cute idea! I love the fabric so much what wonderful way to use it. So happy to hear you already made them! Feel free to share a picture on my Facebook page :o) I would love to see how they turned out! *sings* these are AWESOOOOOOOOOME! *insert little flying note for illustration* How clever are you?? I'm going to pin this to pinterest right after sending this comment, so let me take the opportunity to thank you for the pattern from the bottom of my monster- loving heart before all the rest of the pinterest gals do. So.. THANK YOU! What a cute idea. These are amazing. wow these are just so cute!!! pinning them!!! I absolutely LOVE this! I hate having all those ends too…but it's worth it for something this cute! I have to make this asap! Thanks for sharing at our Pinteresting Party. Fleece and crochet, brilliant! Thanks so much for sharing on Craft schooling Sunday! These are so so cute! I absolutely love them! I'm not sure my limited crocheting skills can handle this though. Thanks for sharing at our Pinteresting Link Party! So adorable! You could also try using 9mm safety eyes. They won't come off, you don't have to sew on buttons, and you don't have to create any more yarn tails with black yarn! Thanks for the cute pattern! So cute!! I'm impressed with the crochet — sewing is SO much easier for me — because it gives such a nice texture! Thanks so much for sharing on Busy Monday at A Pinch of Joy. Hope to see you again soon! Haha. These just made me smile. So fun. Thanks for sharing this week on BeColorful. super bonito! que gran idea, gracias por compartir! Awesome!! Huge Monsters Inc and any monsters of the same style ("Uglydoll", etc.). I used the same material but just for a plain blanket, then accented monsters with UV-reactive paint fabric markers and mounted a UV "black light" nightlight on the wall over my son's bed. The friendly monsters come "on" at night to cover him. i had a go at one of these the other day just for the fun of it and my daughter loved it, but asked for a girl monster (she's comming up on 3) so i have just finished a little girl monster. i replaced the horns with long curls. i have also used minky instead of fleece which seems to e a hit though the fluff got everywhere. lesson learnt the forst time. the second one i did sat on my neighbours front doorstep! tanks for the pattern. Thank you so much for this pattern/idea. After i saw this pattern i went out to find printed fleece myself. I live in the Netherlands and in the shops i was checking i didnt find any monsterfleece, but bought two very cute prints, i probably wont crochet a monster around it but something else, but the idea is really great, wouldnt have thought about it myself. Did you double up on the fabric? I can't really tell from the pictures. Hi Dylan, no didn't double the fabric. How cute are these! My collegue asked me to makt something like this. On a blanket for her kitten. I have a question, I understand you can make holes in fleece. But is it also possible in cotton (my plan is to make a patchwork blanket with fleece on the other side of the blanket)? Doesn't it ruin the cotton? I'm sorry my English is not that good, hope you can understand my question. And thanks a lot for this very nice tutorial! Love this!!! Have you ever made any girly ones…. Like an owl or cat or something ? 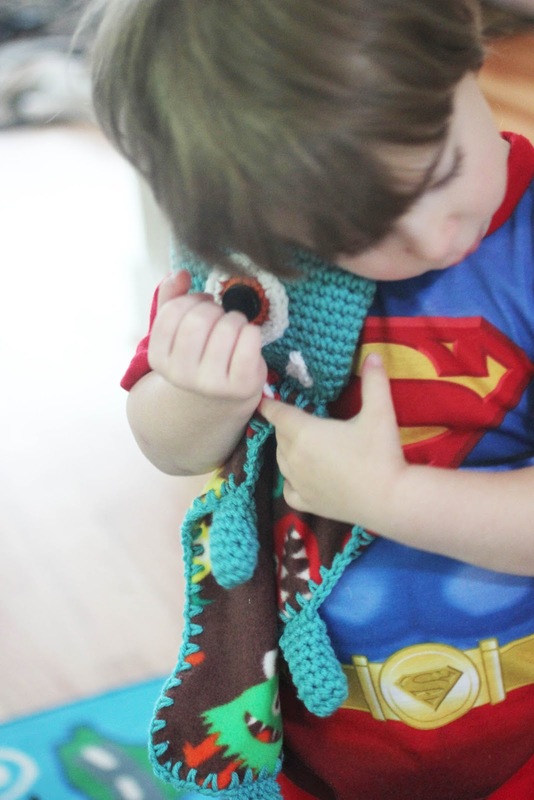 How did you sew the monster pieces on to the blanket? 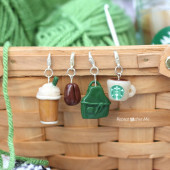 I want to make a couple for Christmas gifts. Thanks! I have 2 Project Linus skip stitch blades. Can you please clarify which one is the "original?" Did you fold in the fleece in half or is it single thickness? Very cute blankets!!!! Cannot wait to go shopping and get the supplies to start this project! Thanks for sharing! I think it is a brilliant idea, I can't wait for my tools to arrive in order to make it. As for the buttons, I don't think it is safe for a young kids, there is always a chance of swallowing and choking. I love your lovey patterns.But,I have some little girls that would love some loveys. Do you think you could come up with a girly pattern for one? These are absolutely "LOVELY". Cant wait to check out the rest of your site! Maybe I could use up some of the material that I tend to buy with no purpose. Thanks! i'm Iris from germany, and ich love your things, they look so cute. i would love to make it too, but i'm not able to find the skip stitch blade you used. How big was the space between the holes in the blanket you made with the blade? i will try to do it by hand, but i need the distance. Any way I can purchase one of these?? They are so cute my nephews theme is monsters and he'll be here any day! I'm not crafty at all and between school and work have zero time! I'd love to buy one!! 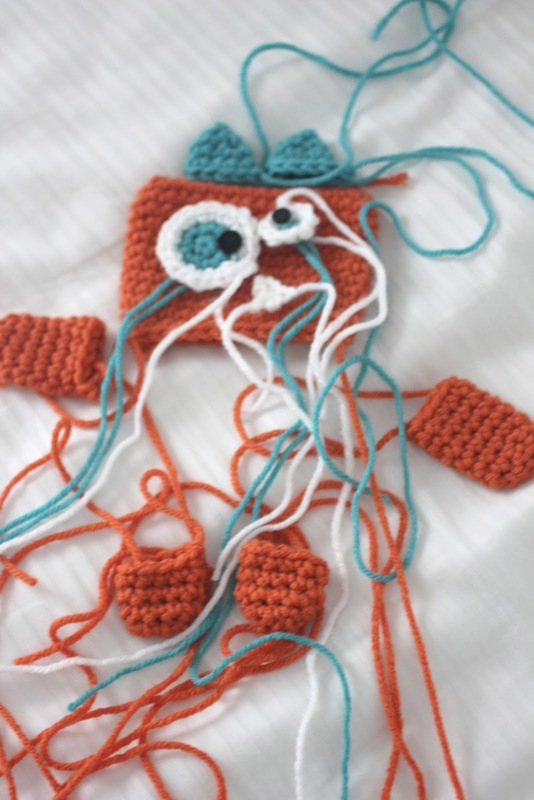 This project is so adorable! I don't have monsters, but I do have animal print. I'm going to find a lion or elephant to adapt for the head. Thanks so much for the great idea! In a previous message you mentioned a Babyghan. Do you have a pattern for that also. 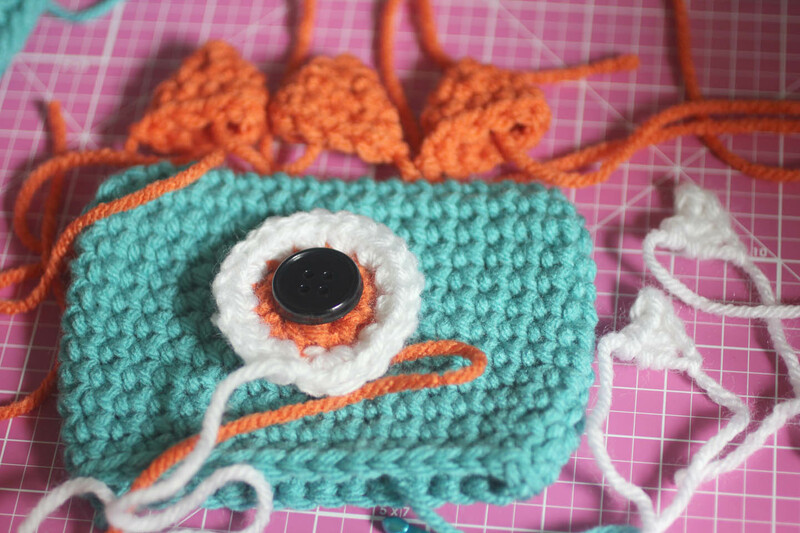 I love the Robot Lovey – have made one and am working on one with a different twist. Thank you. Hi, Sarah, I made a little lovey for my niece and her new baby using your directions and it turned out great. Your directions were very easy to follow. I had never done a magic ring before and learned how from Youtube. I haven't crocheted in a few years. I've been knitting, tatting and quilting but had to do this for a special little person. I have more fabric and will be doing more of these too. Thanks for such a great little pattern. I do not have a skip stitch blade.:(……….. 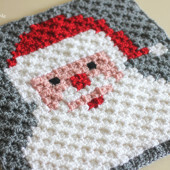 Repeat Crafter, would you be willing to make me two of these and sell them to me? I crocheted a little eye instead of the button . I am having trouble with the head. crocheting on the otherside . can't get 17 sc in. could you show on a tutorial a close up or on you tube.. don't know what i am doing wrong. thanks so much. love it for my grandsons. Did you sew two pieces of flannel? It seems like the back would be “naked”? 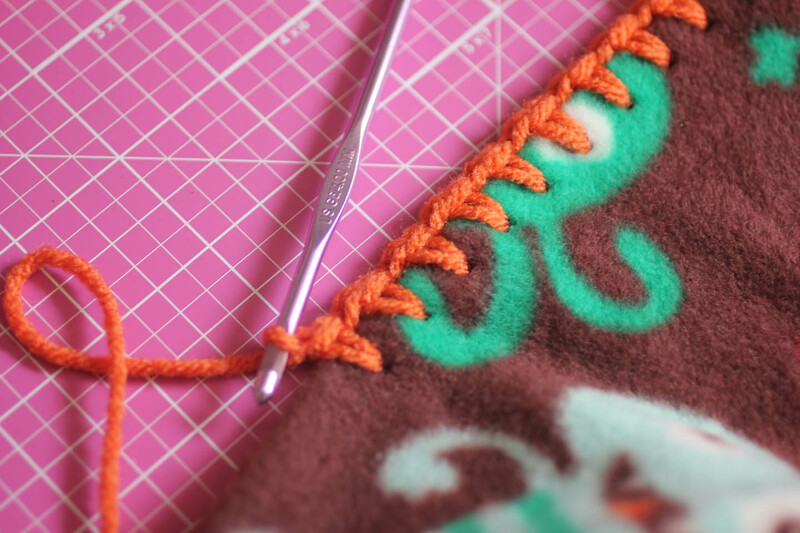 Do you have to hem the fleece or fold it over and crochet through it, or will it not fray? I’ve never used fleece before. Has anyone tried washing this? I want to give it to a friend as a gift but I don’t know if I should wash it first or what it will look like after she washes it. Will the yarn curl and need to be blocked afterwards? I’m using fleece and 100% acrylic yarn. Thanks! Very cute and lovely! I like your post! It really interesting! Thanks for sharing! Oh I just made this in navy and bright blue for a bday mantle garland for my husband tomorrow! Yay! Thank you! It will then go in my son’s room! BONUS! Has anyone tried washing this? I want to give it to a friend as a gift but I don’t know if I should wash it first or what it will look like after she washes it. Really glad that you shared this information with us. I was looking for exactly the same article. Any innovative idea beyond the healthy mind. I really appreciate the diverse piece of content. Thanks for your effort you have made in writing article. I was actually reading your article and found some really interesting information. The thing is quite clear that I just want to thank for it. I was just wondering the great quality of your article. Then let me tell you that your blog is absolutely awesome. Wow…you just wrote a post of my flavor so i want to thanx for it a lot. Its been pleasure reading it. Literally one of the best post I ever read. A few of the most significant names in Search Engine Optimization tools today are Moz, SEMrush and also SpyFu. The real worth in semantic search comes from what’s following: Google will connect the prevalence of testimonials talking about your naan with your dining establishment’s site. Search Engine Optimization devices aid automate the process, whether it’s figuring out which key words are the most effective to purposefully target, the amount of backlinks you have actually established on various other web sites, and even the Search Engine Optimization health of your rivals’ pages. When carrying out keyword research should be a top priority in your Search Engine Optimization audit, assuming concerning natural speech patterns. You can do an easy search in Google for your organisation name and also words evaluations” to start putting together a list of those websites that rank very for your brand and also attribute evaluations from your customers. When picking a Search Engine Optimization device, it is necessary to recognize how it accumulates and also assesses the information so you have a complete photo of exactly what your final numbers truly represent. long time and I realised that is professional, fast to understand. I congratulate you because of this article that I am going to tell to prospects around. page where each university student or learner can find ratings gpa rating. Have you ever heard the Kroger customer satisfaction survey? This program issued by considerable America’s retailing company named Kroger comes with an objective to interact the customers closer and ultimately lets the shopping place you swing by more convenient. These viruses and malwares not only disrupt the normal functioning of the computer programs but also lead to data loss in worst case scenarios. Therefore in order to safeguard your system from such security threats, Norton anti-virus software installation is necessary. Norton Antivirus is extremely simple to use, and it is an advanced Antivirus for your Windows System to install. Norton antivirus is trusted for everybody. Norton AntiVirus is quite a heavy anti-virus solution for Macs but if you’re able to deal with the sluggishness, its worth a go. MS Excel gives you the power to create spreadsheets and it keeps all your recorded on your system and you can use it anytime later when needed. The Microsoft Word may be used to write professional letters, blogs, and other documentation related work and allows you to preview your work before the final submission. This is the place where we as a tech support team expertise. We provide technical support to users facing technical issues while installation. Tried all process and still not able to install, make a call at +1-855-241-6704. We’ll help you throughout the process. Our technical support team are experts and will guide you step-by-step and will make sure that the installation is complete and the user is provided with enough knowledge for future. Great article and amazing content. Lovely blankets! Check out the new variety of hundreds of blankets online at our online price comparison and deals website: http://www.phoneretailers.co.uk. Are you dealing with belkin router problems? check out this article and follow the instructions to fix the problem. Select all appropriate answers relating to the services that you received during your visit. If there are any personal comments, the customer can add few lines about the same in the particular section. Finally, the management will cross check & look upon the answers to make Kroger Stores the best choice for the customers. Are you dealing with belkin range extender problems? check out this article and follow the instructions to fix the problem. Trumendos work really inspired form it because it was actually extraordinary. This Topic is really Nice and informative so there is no doubt . I found this one really fascinating and it should go into my collection. I am very thankful for this . Keep it up. Nice Post But more importantly I think that hard work is making your blog more awesome, wonderful Blog. Keep this Blog Up. Kroger is one of the best retailing companies in the US. However, people looking for its gift cards to get the products. So what you have to do is take part in the customer satisfaction survey and share your views about the company. Thanks for this Lovely Post.I like your all posts. HP Printer Offline Support 1-844-669-3399 USA. Getting Problem with your HP Printer it show offline issue. We are Here to help you any type of troubleshooting HP printer offline problem. Our Technical team 24*7 Ready to fix your HP, Epson,Brother,Canon,Lexmark,Xerox Printers offline problems. Hotmail Login is a simple task, if you follow this steps you can sign in Hotmail easy … Open your favorite web browser and in the address bar, type http://www.hotmail.com. When you deal with belkin router problems? It can be due to the several reasons such as cable connection or other problem. but you can fix them easily by visiting askprob community. all you need to do, visit askprob community and follow the instructions to fix the problem. Also read Tony Robbins Quotes On Leadership! Monster Fleece blankets is awesome. Blog design is also awesome! Thanks for sharing with us! Plus Printers is all set to give you the best custom soap boxes in the market of the United States of America! You will get everything under one roof! My idea of taking part in these competitions is not exactly being the winner. There is an experience factor you acquire from these competitions that will be so valuable in writing books. That is the main concern of mine. OK thanks for sharing this opportunity.. It includes applications, reminders, notepads and an MP3 or MP4. So, it is more of a choice than a trend. Smart Watches in Pakistan are not that common and people are still unaware of many features to look up before purchasing a smart watch. Well posted!! Loved it !!! Very Nice article. I loved it. If your computer has been slowed down, it has been compromised. Attackers and cybercriminals are systems for exploit. Security device, then your device is very susceptible to cyber attacks. If you’re getting norton. It’s extremely pleasant and meaningful. it’s an extremely cool blog. Connecting is exceptionally valuable thing. you have truly helped bunches of individuals who visit the blog and give them useful tips. we will be notified to soon………..
http://www.norton.com/setup gives support for setup of Norton Security Products. Norton products are sold in the form of retail cards which help in an easy setup of the security product through the internet instead of setup with the help of a CD. If Norton detects any virus or worm, it immediately alerts the user and blocks/isolates the said virus. Norton.com/nu16 – Information about download, install & activate norton nu16. If you face any error or issue while installing the Norton NU16 then you connect to the Norton Customer Service. looking at a few of the articles I realized it’s new to me. Anyhow, I’m definitely delighted I stumbled upon it and I’ll be book-marking it and checking back often! here is a complete guide of norton antivirus. Here is the complete guide for aol email problems? My pal illuminates me concerning this weblog. There is lots of appropriate information on this weblog, I cherished knowledge it and I parent humans gets a large amount of help from this blog. I substantially find it irresistible capabilities from this additionally. I accept as true with you like this weblog. I consider procuring a massive quantity of assist from this blog. Norton.com/Setup – Norton is a well-known name offering a variety of security services to their users.It has marked its name in the market of personal as well as business security. Seomasti provide best submission site's, high authority site, director, bookmarking, classified posting, article and many more. cardboard boxes from the last ten years. thank you for this article keep it up i like your article i love to read. Absolutely loved your blog! it gave a broad understanding of how the monster blankets are handled and fully explained its specialized fields. Designs were great. keep up the good work. Very Nice article! i love to share this instructions. Awesome Article! I love it. Thanks for sharing the information with us, it was very informative. Norton antivirus is designed to detect and eliminate the possible threats for a system like worms, Trojan and other viruses and can perform multiple application scan. McAfee antivirus is one of the most used and trusted antivirus in the world today. It serves you the best security services which helps to secure system and networks. Digitization is covering the technical as well as the non-technical dimensions of our lifestyle. With the enhancement of technology, new challenges are also coming in front of the cyber world. Its technique of using signature and heuristics to identify viruses makes it one of a kind and a better security provider for your PC.